The approval process ensures that time is entered correctly for more efficient and accurate project and Time Off analysis. TimeLive provides a default approval process that you may customize for your organization. If you choose to customize this process, you should change the approval settings before creating projects and allowing users to enter timesheets/expenses. Approver types identify the individuals who will be approving users’ timesheets and expenses. You can set up many different approver types, each of which will have a specific approval function within the approval path. Simultaneous / Alternate Approvals. Multiple approvers can receive and approve the same item concurrently. For example, if you have defined two approval types named Supervisor and Administrator, you can assign them both 1st position in the approval sequence, and they will both receive approval items simultaneously. Users complete their timesheets by entering time against projects or time off codes. Users can enter time only for those projects for which they are part of the project team. All time is either billable or non-billable. Once completed, users submit their timesheets for approval. Once submitted users’ timesheets are sent to the appropriate project leaders, clients, and supervisors for approval. Approvers can approve or reject the timesheets. Approved timesheets are closed so the data can be processed. TimeLive sends e-mail notifications (if enabled) to inform approvers when timesheets/expenses are waiting for approval, and to inform users when timesheets and expenses have been rejected/Approved. To launch timesheet approval, click on My Approvals at the left-hand navigation menu. 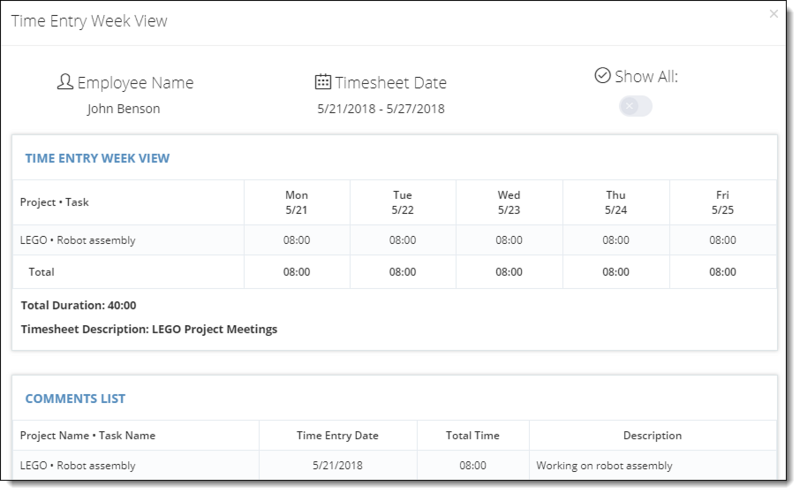 An approver can see whole period timesheet by clicking on Employee Name link. This will launch a read-only view of employee time-sheet period. Select [Approve] on time entry record which you want to approve. Enter your comments in “Approver’s Comments”. Click on [Update Approvals] button to confirm these approvals. Select [Reject] on time entry record which you want to reject. Click on [Update Approvals] button to confirm these changes.